Palestinians react to tear gas fired by Israeli troops during a protest at the Israel-Gaza border in the southern Gaza Strip, July 13, 2018. A 15-year-old died Friday in Gaza during Palestinian clashes with Israeli forces along the Gaza border. The Gaza Health Ministry reported Friday that the Palestinian teenager was killed during clashes that also saw 25 people injured. The death brings to 136 the number of protest deaths on the border since weekly clashes began March 30. The demonstrators have been launching kites and balloons equipped to spark blazes on the Israeli side of the border. Relatives of Palestinian Othman Helles, 15, who was killed at the Israel-Gaza border, react in Gaza City, July 13, 2018. In response to the Friday protests, the Israeli military says it struck several targets in the Gaza strip early Saturday. The statement said army “fighter jets targeted an offensive terror tunnel in the southern Gaza Strip, in addition to several terror sites in military compounds throughout the Gaza Strip.” There were no reports of injuries from the strikes. Even as the Israeli airstrikes were being carried out Palestinians fired 17 rockets toward Israel. Israeli media say there were no injuries in those attacks. The Palestinians say they are protesting a plan by Israeli authorities to demolish a Bedouin village in the West Bank. On Friday the Israeli Supreme Court said it would delay a decision on the village until at least August 15. Israel says the Palestinian demonstrations provide cover for the military wing of Hamas to breach Israeli security. Also Friday, the European Union demanded that Israel re-open the Kerem Shalom border crossing that has been closed since Monday. The crossing handles the passage of most commercial goods and humanitarian aid into Gaza. 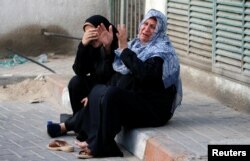 Israel said the closure was retaliation for the airborne incendiary attacks.